How best to handwrite scores? I'm currently terrible at writing scores, my handwritten scores look ugly and are often unreadable. When I wrote lead sheets by hand (this is a quarter-century ago, mind you), I used a felt-tip calligraphy pen. I held the pen so that the nib essentially was up-and-down on the page (that is, parallel to the bar lines). This gave me fairly easy-to-draw note heads, thinner stems, and thicker beams. With practice, it was not difficult to achieve results similar to those in the Real Book. ETA: I should add that I have fairly good handwriting, when I choose to; I never worry, for instance, that a word I write will end up looking anything other than what I intended, more or less. As a result, writing scores came fairly easily to me. The more inconsistent your handwriting is, the longer it will take. That's what the practice is for—to gain consistency. But it will come, I think, with practice, no matter how haphazard it may seem at first. Make sure you actually understand standard engraving practices. Before starting school I would write out scores by hand and they looked terrible. Once I learned how long to make stems and which direction to use for them and so on, everything improved dramatically. And then have some simple tools. Start with pencil and a clear plastic ruler (the 6" kind that are perfectly flat). Always use a ruler to draw straight lines. Actually that's all you really need. There are drawing templates available that have a variety of musical shapes that you can also use but I think you're better off doing them yourself (and that way some of your own style will come through). After completing the score in pencil then you can go over it in ink and erase your pencil markings. If you know calligraphy then you can use one of those fancy pens that allow you to smoothly transition from a line to a broad stroke and at least your clefs can look really fancy. 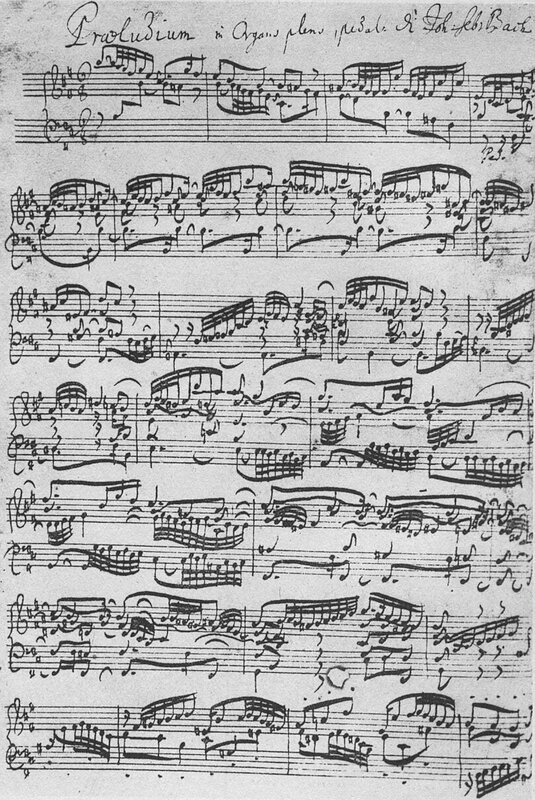 If you really want to learn how to produce a score like that by hand, I suggest you find a pen with a copperplate nib. Osmiroid used to make copperplate nibs for their interchangeable-nib fountain pens; Speedball apparently still make such nibs for dip pens. A nib of this kind draws a thin line when you just touch it to the page, but you can make the line thicker by pressing slightly harder. The quill (or other such pen) that produced the score in your photo evidently had these same properties: observe how the beams often taper off toward one end (or even both ends). That is, the widths of the lines drawn by the pen that inked this score were variable, even when the pen was traveling in one direction (as is evident from some of the straighter beams). Note that there is a type of fountain pen tip called a "music nib", and it's specifically designed for writing this musical notation. That is why you should do plenty of theory exercises. So you can learn how to write notes. There is no easy way around it you just have to do it. It takes lots of practice and is very much analogous to how primary school children start writing letters and numbers. Your theory teacher should give you good guidance to keep the notation neat and then it take lots of practice. It starts on the middle line on the staff. Goes from twelve on the clock with the clock all the way round. It then makes a little twirl back to twelve. It goes straight down from twelve to six and makes a little twirl to the left. This one starts on the second line from the top on the staff. You write a little dot and then it curls to right. You then you write to little dots above and below in the spaces from the second line from top. Notes that have stalks go a certain way. I always tell my students note stalks go like the letters "p" and "d" not like "b" and "q" The stalks are also note just lines that go up from the middle of the note head. If the note is notated on the middle line the stalk will do what the notes before the note that is on the middle line did. So If the note before the note on the middle line is above the middle line and has a stalk going down the note on the middle line will also go down. Notes take one space whether they are on lines or in spaces. If a note is one a line it takes half the space above the line and also half the space below the line. If they take all the space above and below the line they are too fat and incorrect. If notes are in space they simply take all the space between the two lines. Again if they go over or below the lines they are too fat and incorrect. When writing orchestral scores, my favourite pencil is the Pilot super grip 0.5. My favourite rubber is the Staeder rubber. I use the big rubber for rubbing out bars, and the small rubber for rubbing out small things like accidentals. The manuscript paper I use is the Novello Manuscript Book 20 it has 26 stages per page, and is A3 paper. I can speak more to the legibility than the beauty, so here's what I have to offer. Note heads should be the size of a space within a clef and generally have a slant to them from lower left to the upper right. So a note that falls on a space should fill the entire space, with the bottom left just about touching the lower line and the top right just about touching the upper line. Notes that fall on a line should extend above and below to about halfway through those spaces. Stems should generally be an octave in length and any notes on a ledger line should extend to the middle line of the staff. When I have a set of 1/8 or 1/16 notes that should all be connected, I like to draw out the first and last stems of the set, connect them, then add in the additional stems. You should end up with a smooth, straight line connecting the stems. It's important to leave enough space for all the notes that you have. The example you provided has a few spots where things seem a little squished together, making it more difficult to read. I would also note that the example you provided is highly stylized and I would find that incredibly difficult to sight read. So as nice as it looks, I'm not sure that it's function is fulfilled as well as it should be. If I were to look to make my handwritten scores more pleasing to the eye, I would most likely focus on things like clefs, since those are a little more obvious, and single note flags (not connected to other flags). Some of what is stylized in the example could still be used and remain legible, like some amount of curve to the connected flags but it's when you take things too far, making them overly stylized, that things become more difficult to read. What are good sources for free orchestra scores? 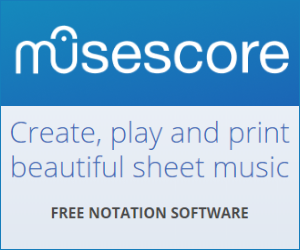 How can I rehearse and perform with PDF scores on screen instead of paper scores? How are Band Scores and Piano Scores Similar or Different? How does one know if a score is notated well?